These are the thicker framed doggles that wrap completely around your dogs' eyes. They are perfect for motorcycle rides or if your pup likes to ride with the windows down! 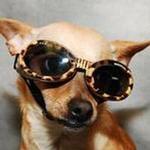 These Leopard print Doggles will bring out the wild side in your litle love! 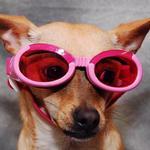 Our shiny pink Doggles bring out the girl in us all! These shiny blue Doggle Frames are perfect for your little boy! Our metallic black Doggles are our most popular Doggle. Good for boys or girls! This is the Chrome Frame option for Doggles. These new Green Camo Doggles are perfect for your little adventurer! These silver skull Doggles are perfect for showing off your little's one wild side!